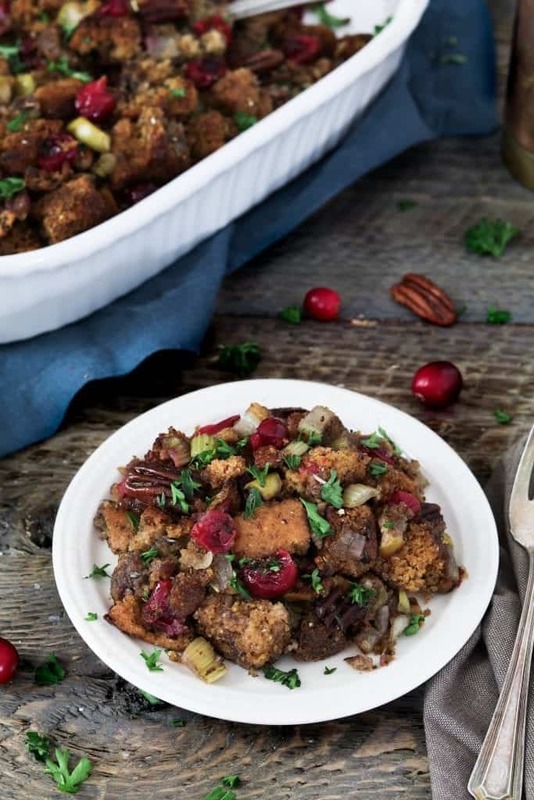 This Vegan Cornbread Stuffing will be the star at your holiday table. It’s gorgeous to look at and chock-full of autumn flavors. A few weeks back on Facebook, I asked some readers what type of Thanksgiving recipes they’d like to see on Vegan Huggs. I received SO many tasty suggestions, but unfortunately, I didn’t have time to make most of them. I guess I should’ve asked sooner. However, I was able to post a few holiday favorites, like this Roasted Butternut Squash, this Skillet Cornbread Recipe, and today’s Vegan Cornbread Stuffing. A lot of suggestions were for “dressing” and I’m so not used to calling it that, so I thought everyone wanted salad dressing. “Such a healthy bunch”, I thought. I grew up calling it stuffing, even when it wasn’t stuffed, so dressing makes me think of salad. So I was able to grant the request for dressing, but my brain has to call it stuffing. Fair enough? I usually make my Sourdough Bread Stuffing every year, but I thought it would be nice to change things up. It’s good to get out of your comfort zone sometimes. So, I made some extra cornbread and tested the waters. My very first batch of Vegan Cornbread Stuffing was born and it was a success (in my humble opinion). It has the perfect balance of saltiness from the sausage with a hint of tart & sweet flavors from the apples and cranberries. The toasted pecans add a soft buttery flavor too. I added all the herbs and veggies from a classic stuffing too. The sage, thyme, rosemary, and parsley will bring optimum flavor, to your already flavorful dish. I think it worked out quite nicely. 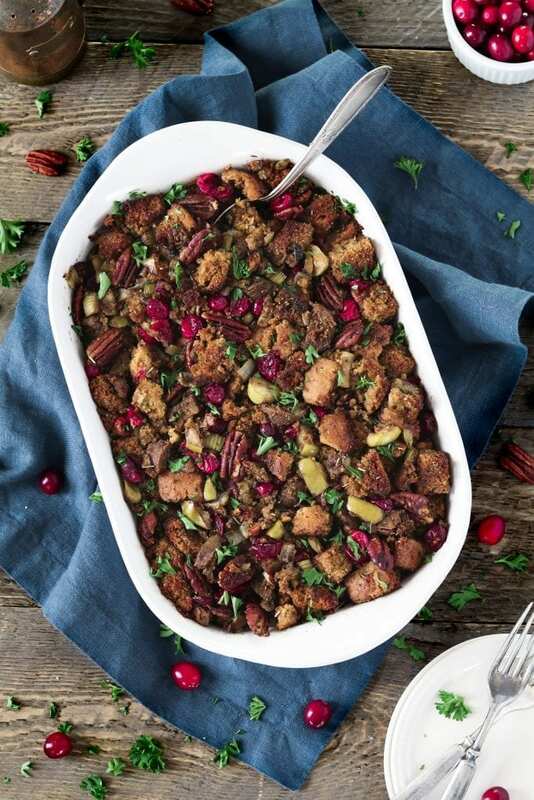 Every ingredient compliments one another and makes this stuffing really addicting. Beyond satisfying too! There are a few extra steps than your average stuffing recipe, but it’s really easy to prepare. It will be worth it when you hear all the compliments you get at dinner. Feel free to use any cornbread recipe you’d like or one from a box. It all works! You can even buy store-bought cubes if you can find a vegan variety. Thanksgiving is next week, so it’s probably a good idea to hit the stores this weekend. Go early to beat the crowds and avoid out-of-stock items. Don’t forget your list! 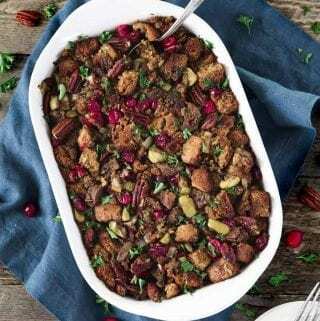 If you make this Vegan Cornbread Stuffing, I’d love to hear what you think in the comment section below. It would really make my day. You can also follow me on Instagram and share your creation with me. Just tag me @veganhuggs and hashtag #veganhuggs so I don’t miss it. Preheat oven to 350 degrees F. Lightly grease 9x13 baking dish and set aside. Spread bread cubes onto a baking tray and place in oven until they are dry & toasted. About 15-20 minutes. Move them around occasionally and keep an eye on them so they don't burn. Place the toasted cubes in a large mixing bowl and set aside. *See note for an alternative drying method. Prepare flax eggs in a small cup or bowl by mixing together the ground flaxseed & water. Set aside about 10-12 minutes. In a small saucepan over medium-high heat, add the cranberries and sugar with one tablespoon of water. Cook until sugar dissolves and cranberries soften and some burst. About 5-6 minutes. Set aside. In a large pan, add 2 tablespoons of butter over medium heat. Add onion, celery, apple, and garlic, sauté until softened. About 5-6 minutes. Add 2 tablespoons fresh parsley, thyme, rosemary & sage, sauté for 1-2 minutes, until fragrant. Add remaining 2 tablespoons of butter and sausage. Sauté for 5-6 minutes until sausage is lightly browned. Remove from heat and add the mixture to the bowl of bread cubes. Add flax eggs to 1 cup of broth and combine (this will help to distribute evenly over the cubes). Start slowly pouring over cubes and toss gently to combine. Add cranberries, pecans, salt, pepper and remaining 2 tablespoons of parsley. Toss gently to combine. Keep adding broth until desired moisture is achieved. The bread should be very moist, but not soggy. Let the bread sit a minute to determine if it needs more broth. Make sure all of the liquid is absorbed into the bread. Taste for seasoning and add more as needed. Place mixture into your prepared baking dish. Wrap tightly in foil. Place in the oven and bake for 30-35 minutes. Remove foil and bake uncovered for 15-20 minutes or until lightly brown & crispy on top. (*optional: I like to brush on some melted butter before baking uncovered, for an extra crispy top). Let sit 10 minutes before serving. * Pecans: to toast the pecans, preheat your oven to 350 degrees F. Place the pecans on a baking sheet and lightly spray with cooking spray. Toast them for about 5 minutes, until they become fragrant. They burn easily so keep an eye on them. You can toast the pecans days before and store them in an airtight container on your counter. * Vegetable Broth: I like to use low sodium broth, so I can control the salt taste. Some broths are too salty and can ruin a good recipe. If you would like to use a regular broth, make sure to cut down the added salt in the recipe. Taste as you go along. Another option is to blend low sodium and regular broth together. * Another way of drying your bread cubes is by spreading them out on a baking sheet and leaving them out overnight to get stale. * This recipe will work the same with white bread or sourdough bread. * The consistency of stuffing is all a matter of taste. Some people prefer it moist (almost bread pudding-like) and some people prefer a drier stuffing. So this is why the broth amount is just a guideline. Add more or less liquid according to your stuffing preference. *Just remember to add liquid slowly and give it time to absorb into the cubes. * If you feel you over moistened the stuffing (before you've baked it) you can add more dried bread cubes. If you don't have anymore sourdough, you can use any type of dried bread or even non-seasoned breadcrumbs. * If your stuffing seems too soggy after it has baked, you can spread it on a baking sheet and bake for 10-15 minutes more. * If your stuffing came out to dry after baking, you can remoisten it with warm vegetable broth and a tablespoon of melted butter and gently combine. Cover and bake for another 15-20 minutes then bake uncovered for 10- 15 minutes if you want a crispy top.